It's time for part two my Christmas inspiration series and today I bring you another special idea for a unique home made tree ornament. Now, I don't know how you feel about Christmas ornaments but over the years I have really begun to appreciate the ornaments that have a story behind them, not the ones that come in sets of 30 from Homebase but the odd baubles and trinkets, the ones that were handed down to you or that you spotted on a market stall one Christmas. Last year I painted my own ceramic bauble and I was so happy with it and the story that I have about it and this year I want to add some more unique ornaments made by my own hand. To that end, today's craft idea is.. I believe these little trinkets are the brainchild of one Martha Stewart and when done properly they look a little something like this..
Aren't they precious?? Now, those of you who have been keeping tabs on me for some time may remember that I posted about buying some cookie cutter shapes that were too small, minuscule in fact, and fit for nothing...until now. If you don't have old cookie cutters lying around you could invest in some Christmas themed ones, no big expense required. Get hunting for some of your favorite patterns and print them onto card or paper. All you Cath K lovers could use some of the digital wallpapers that are available on her website or keep your eye out for any free printable wrapping papers in your favorite prints. Next, simply draw around the outer edge of the cookie cutter and cut out your paper shape, attach with glue and there you have it, an easy, country chic ornament made by you to be handed down for years to come. 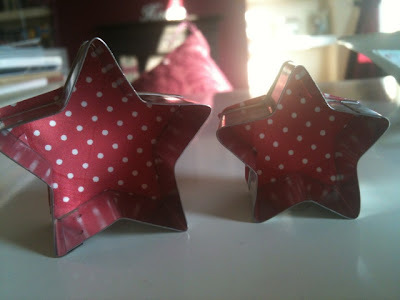 For my little stars, I used some left over pink polka dot card that I had from a different project and I love the effect. I didn't need big ones because my tree will be fit to burst this year even if it is a foot and half taller than my old tree..
And there they are, all spotty and chic! 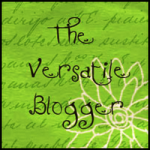 Join me again for part 3 where I will be sharing my home made card designs.